This is an interesting piece over at the Audacious Epigone. 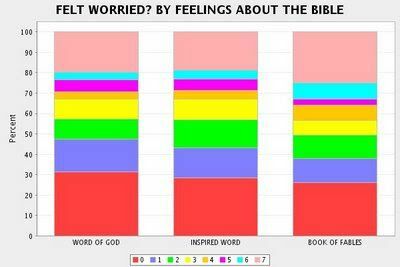 It shows that the deeply religious worry the least, which makes perfect sense to me. I’ve always seen that the religious were disconnected from the stress of the world–not only because they tend to be (both on purpose and by way of their culture) isolated from many external experiences, but also because they know in their hearts that no matter how bad things get–heaven is waiting.